On the heels of significant Democratic midterm victories in Michigan and Wisconsin, the Republican-controlled legislatures in both states have advanced plans to limit the authority of the states’ newly elected governors. Democrats say the move in the critical Midwestern battleground states where their party reclaimed both governorships for the first time in nearly a decade ignores the will of the voters and undermines their ability to govern. Neither plan has been signed into law yet, and Democrats in both states say they are likely to mount legal challenges to what they have decried as GOP power grabs. Working overnight Wednesday and into the morning, the Wisconsin State Senate and State Assembly approved a sweeping plan to empower the GOP-controlled state legislature and greatly limit incoming Governor Tony Evers’ authority over key areas of the state government. The bill now heads to the desk of outgoing Republican Governor Scott Walker, who has signaled support for the bill. On Wednesday, Evers said he was planning on making a personal appeal to Walker to veto the bill. 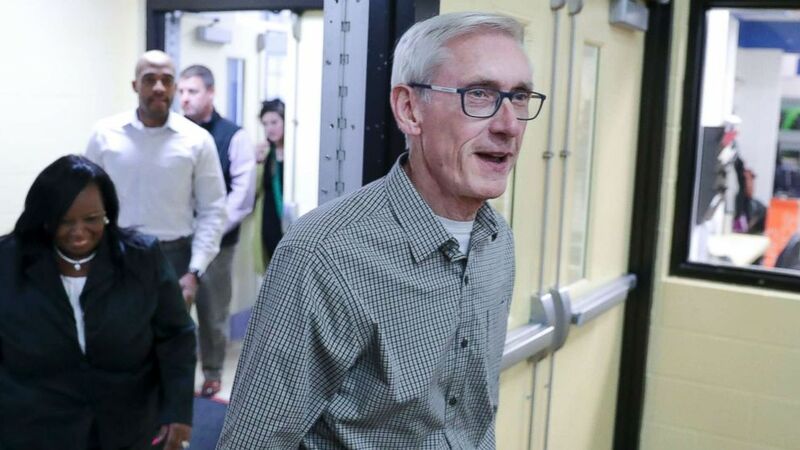 “The will of the people has officially been ignored by the Legislature,” Evers said at a press conference, “Wisconsin should be embarrassed by this,” Evers said. State legislative Republicans are disrespecting our democracy and the people of Wisconsin with this #WIPowerGrab. House Speaker Paul Ryan has remained silent on the situation in his home state. A spokeswoman for Ryan did not respond to a request for comment on the plan when asked by ABC News. Speaker of the United States House of Representatives Paul Ryan speaks inside the Rotunda of the U.S. Capitol, Dec. 3, 2018 in Washington. Another provision would weaken the attorney general’s office by requiring a legislative committee, rather than the attorney general, to sign off on withdrawing from federal lawsuits. That could prevent the state from pulling out of a lawsuit challenging the Affordable Care Act (ACA), something Evers promised to do. Robin Vos, the apeaker of the Wisconsin State Assembly, told reporters the day after the election that the plan is meant to “re-balance” power following the Walker administration. “Maybe we made some mistakes giving too much power to Gov. Walker and I’d be open to looking at that to see if there are areas we should change that,” Vos told reporters. After his re-election as speaker, Vos added, “We are going to stand like bedrock to guarantee that Wisconsin does not go back,” Vos added. The Republican state Senate Majority Leader, Scott Fitzgerald, called the blowback to the plan “manufactured outrage by the Democrats,” and said that while they trusted Walker, a Republican, to handle the “back and forth with the legislature,” they do not trust Evers, a Democrat. In Michigan, a similar drama is playing out as the Republican-controlled House and Senate are seeking to limit the power of incoming Democratic state officials, including Gov.-elect Gretchen Whitmer. Among the bills that have advanced so far during the lame-duck session are ones which create a campaign finance commission, give the legislature the ability to intervene in lawsuits, and rollback a previously-approved increase in the minimum wage and paid-sick-leave mandate. The minimum wage and paid-sick-leave legislation, which passed Tuesday, are reversals from September when they were approved in Lansing. But even then, supporters of the actions, which gradually raised the state’s $9.25 minimum wage to $12 by 2022 and required employers to offer paid-sick-leave, were mindful that their passage was likely an attempt to prevent voters from deciding on the changes themselves. Michigan Gov.-elect Gretchen Whitmer high-fives Lt. Gov.-elect Garlin Gilchrist II during their post-election news conference in Detroit, Nov. 7, 2018. Over 350,000 Michiganders signed petitions to place the initiatives on November’s ballot, an effort rendered moot when they were passed by the legislature. But, as anticipated, now that Election Day has passed, the chambers altered the laws, delaying the wage increase to 2030 and reducing the required paid-sick-leave hours while providing a loophole for business with fewer than 50 employees. The campaign finance commission would assume a number of responsibilities currently under the purview of the state secretary of state. Republicans argue that the new body, which would be made up of three Democratic and three Republican legislators appointed by the governor, would promote bipartisan cooperation. Democrats have pushed back, claiming that the secretary of state’s office – held by Republicans since 1995 – generally conducts its business in a non-partisan manner anyway and that the move dilutes the authority of incoming Secretary of State Jocelyn Benson. Benson, who wrote a 2010 book on state secretaries of state, is widely thought to be highly qualified for the position following stints as a law school dean and Southern Poverty Law Center board member. Democratic Attorney General-elect Dana Nessel is thought to be the aim of an additional bill which provides the legislature with the right to wade into legal battles involving the state. Attorneys general frequently decline to defend challenges involving legislation that conflicts with the views of the executive branch. The new law, if signed by Gov. Rick Snyder, would allow the legislature to intervene and potentially protect their actions in the attorney general’s stead. Democrats call the move a breach of separation of powers. April 9, 2019 Comments Off on U.S. Readies Another $11 Billion in Tariffs on E.U.